The U.S. military targeted an al Qaeda-affiliated terrorist in a “counterterrorism” airstrike in Libya late Saturday, the Pentagon announced. Col. Steve Warren, a Department of Defense spokesman, identified the target as Mokhtar Belmokhtar. “Belmokhtar has a long history of leading terrorist activities as a member of AQIM, is the operational leader of the Al Qa’ida-associated Al Murabitun organization in Northwest Africa, and maintains his personal allegiance to al-Qaida,” Warren said in a statement late Sunday. 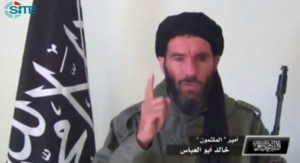 The Pentagon said Belmokhtar directed the 2013 attacks at a gasfield in Algeria that resulted in the deaths of at least 38 individuals from ten countries, including three Americans. Libya’s government said the strike killed Belmokhtar, Reuters reported.